The abbey precincts occupied an area bounded on the east by the River Trent and on the west by the present High Street and Lichfield Street. The whole site extended to 14 acres. The church stood at the northern end of the site on ground now occupied by part of the Market Place and by the 18th century church of Saint Modwen. The cloister and the conventual buildings lay immediately south of the church, an area now largely covered by the current market hall. Further to the south and west was a walled courtyard with an outer court beyond. The latter was approached from the west through the gatehouse. South-east of the cloister and next to the river was a detached building thought to have been the infirmary. There is very little remaining evidence of the monastic layout but there are a few surviving plans of the church and cloister drawn up in the mid 16th century. The church is known to have been divided into an upper and a lower church, that is, a monastic east end or choir and a non-monastic nave to the west, although the plan does not indicate any clear divide. It shows transepts on either side of the chancel with a tower above the crossing. A tower is also marked at the west end between two smaller transepts or porches. The nave extends westwards beyond the tower, and it has been suggested that this projection may have been a large porch. The most famous image is the above 1661 engraving from the river by Wenceslas Hollar but this does not entirely agree with known records so contains ‘artistic license’ and is therefore, a partly speculative re-constructed from another Benedictine abbey of the time with better surviving plans. The chancel (part of the church near the altar) had fallen into ruin after the dissolution, but a south leg of the transept (main cross-shape) ending with an ornate gable with angle turrets that most likely late date from the 13th century. There is a polygonal central tower as well as an embattled north-west tower with tall traceried windows. Any westward extension of the nave has either disappeared or is hidden by trees. It has been suggested that the curious fenestration of the south wall of the nave may be due to a lowering of the aisle roof after the dissolution, and the consequent exposure of a Norman triforium (arcade above the arches of the nave) which was later glazed. The row of five arches, each enclosing a pair of round-headed openings, is typical of such a triforium. The clerestory (upper row of windows) and embattled parapet above appear to be of later medieval date. It is possible to trace the history of several of these features. The early 11th century church seems to have been divided into an upper and a lower church. In 1114, at the end of his abbacy, Abbot Nigel (or Niel) began building at the western end of the church, and his successor Geoffrey (1114-50) erected an elegant tower, roofed with lead, over the choir. The central part of the church shown in the engraving most probably dates from this period. The east end was re-modelled in the late 13th and earlier 14th centuries. The chancel was rebuilt under Abbot Packington (1281-1305) and the work was completed around 1293. A new high altar was dedicated by Abbot de Burton (1305-16) at the end of 1305, and Abbot Bryknell (1340-7) was responsible for a great window over the high altar. The bell tower mentioned in 1340 as adjoining the market-place would be the north-west tower of the church, and this is probably the tower mentioned early in the 14th century. Abbot Ibstock (1347-66), possibly while he was still almoner, rebuilt the northern side of the lower or parish church. Abbot Southam (1366-1400) recast the three great bells in the tower of the lower church. Under Abbot Sudbury (1400-24) Richard Creyhton while sacrist carried out some work in stone in the chancel and re-roofed the lower church. Richard Babe as prior and sacrist was responsible for some stone work in the tower of the upper church and also for new stalls in the choir. Under Abbot Henley (1433-55) the tower of the lower church was completed and a bell placed in it. In 1474-5 the tower of the upper church collapsed, causing extensive damage to that part of the building. Abbot Feld promptly repaired the damaged walls, rebuilt one of the four pillars of the choir and the arch between the upper and lower church, erected a new high altar with steps to it, re-roofed the upper church, and began a new tower. There were several side chapels and altars in the church. The altar of Holy Cross is mentioned in the early 13th century and again in 1254. Abbot de Lisle (1222-9), having come from Bury St. Edmunds, built and endowed a chapel of St. Edmund. This was repaired by Prior Richard Lythum shortly before 1428 when the bishop granted an indulgence to all who said prayers and masses there for the dead, and especially for the souls of Richard and his parents. The chapel of St. Mary was begun under Abbot Laurence (1229-60), and in 1254 money was assigned to the sacrist for the maintenance of a lamp before the altar of St. Mary. Around the same time, a further gift was made for a candle before the statue of St Mary during the celebration of her daily mass. The chapel was evidently completed during the time of Abbot Stafford (1260-81) together with prior Michael. It was the most important of the chapels, with its daily mass, its own keeper and, by the 15th century, its own singers. In 1335, its revenue from endowments was £4 a year. The altar of St. Nicholas is mentioned in 1254, and in 1305 Abbot Burton dedicated the altars of the Apostles and the Martyrs. Ex-Abbot Southam was buried in the chapel of the Martyrs in 1401. The chapel of the Confessors was built by Abbot Longdon (1329-40), and ex-Abbot Sudbury was buried there in 1425. Some time after the foundation of the abbey the remains of Saint Modwen were transferred there from their previous resting place on the island of Andressey, near the current day ‘Cherry Orchard’. A replacement shrine was built in the abbey; decorated with gold, silver, and jewels, it was ‘satis preciosum’ by the time of Abbot Leofric (1051-66), who despoiled it to buy food for the poor during a famine. William I visited the shrine. 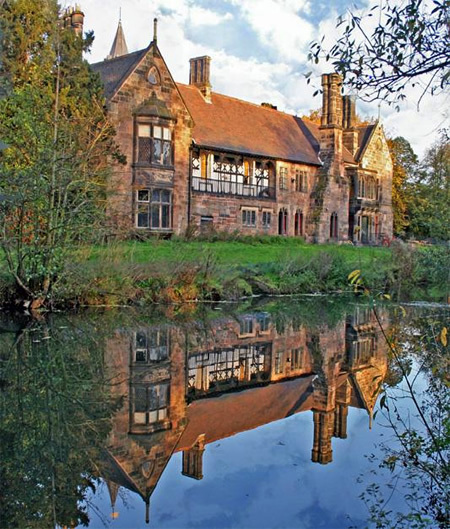 It was rebuilt early in the 15th century by Prior Babe. Andressey, however, remained sacred to the memory of St. Modwen. A chapel of St. Andrew there was dedicated by the bishop early in the 13th century and endowed by Abbot Melburne. It had its own keeper, and in 1535 its income from offerings was £2. It was rebuilt by Abbot Feld (1473-93) and was by then known as the chapel of St. Modwen. It was evidently here that the statue of St. Modwen was kept ‘with her red cow and her staff which women labouring of child in those parts were very desirous to have with them to lean upon and to walk with it’. At the end of Friars walk was an inlet from the river that ran into a large pond called the Stew Pond and was also know as the Harbour. The lawns next to the present day library stand on the site of the original pond. This was where the monks kept their fish stocks. The Stew Pond ran into the Hay Ditch which was an artificial channel that ran from the Stew Pond to Bargates. It passed along the bottom of the gardens in the High Street and was crossed at intervals by small wooden bridges to gain access to the Hay Walk. The ditch served as both an irrigation ditch and as a way of keeping fresh water flowing into the Stew Pond. Doors from the upper and lower church gave access to the cloister, which the 16th century plan show as exactly 100 feet square. Some rebuilding of the cloister was carried out in 1431, beginning at the corner against the almonry – probably the north western corner. Bishop Heyworth’s gifts to the abbey at his death in 1446 included £40 for building the cloister. The chapter-house led off the east walk and was rebuilt by Abbots Longdon (1329-40) and Bryknell (1340-7). The few remains of the chapter house, cloister wall and parlour doorway are in the grounds of ’The Abbey Inn’ (now The Winery) at the rear of the market hall. The remains of the doorways were re-discovered by Robert Thornewill, of Thornewill & Warham iron founders in 1850, when he rented the building as a private home. According to the 16th century plan the east range continued southwards beyond the line of the cloister to support a dormatory above. A stairway shown at the east end of the south walk presumably gave access to it. It is not clear whether the plan depicts the east range at the same level throughout. The dormatory is shown separated from the south transept of the church by three chambers. These chambers may be intended to represent the sacristy, chapter-house, and parlour, or, alternatively, rooms above them, and this part of the east range was evidently roofed separately. The dormatory is shown with six ‘cells’ along each side with a larger one at its south end. The refectory occupied the south range. 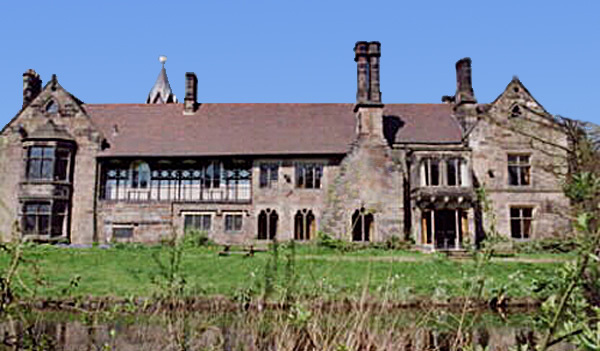 The west range accommodated the abbot’s rooms. Abbot Ibstock (1347-66) added the abbot’s private chamber between the great hall and the ‘outward’ chamber, while Abbot Feld (1473-93) erected what was described as the Abbot’s Chamber. The ‘house of stone next to the church’ was given to the almoner by Abbot Laurence (1229-60) was for the reception of the poor. Abbot de Burton (1305-16) erected a long building by the gates of the abbey, and in 1326 his successor Abbot Bromley assigned it to the chamberlain for use by the brethren as a common chamber. In 1428 Abbot Mathew began building the abbey gates on the west of the precinct. Abbot Henley (1433-55) further extended the work to them. These were situated at what is now the road to The Abbey Inn (now the Winery) between the Market Place and the Memorial Gardens, opposite the end of the present New Street. They are shown in the above late Victorian photo. The remains of the Abbey gates were finally demolished in 1927. 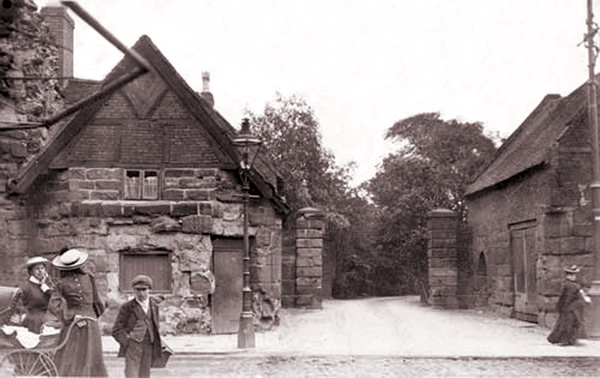 Part of the gate and one of the arches were rebuilt in Newton Park where they still stand today. What I have always thought of as ‘The Abbey’ (now slightly frustratingly, known instead as The Winery’) was referred to as “The great hall by the water of the Flete (fleet?)”. It was a separate, detached annex built in the time of William de Bromley who was Burton Abbot from 1316 to 1329 (which included the time when Burton was attacked by Edward II). As well as a great hall, it is known to have included an infirmary. Remains of the medieval building are still incorporated into the present day building but most of what is now seen is a mock Tudor facing as a result of a major renovation. Remains were excavated in the late 19th century which suggested a partly timber framed structure at right-angles to it.